This is a sight word activity. Students read and trace the sight word, stamp or build the word with letter tiles, and write the word. 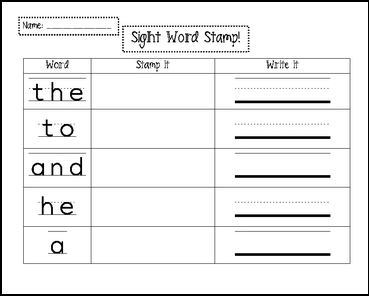 This activity includes 20 sight words that are part of Dolch List #1. If you find this activity useful, Lists # 2 - 11 are posted for ONLY $2.75!! I use the activity during literacy centers and students complete it independently. I hope you can use it!